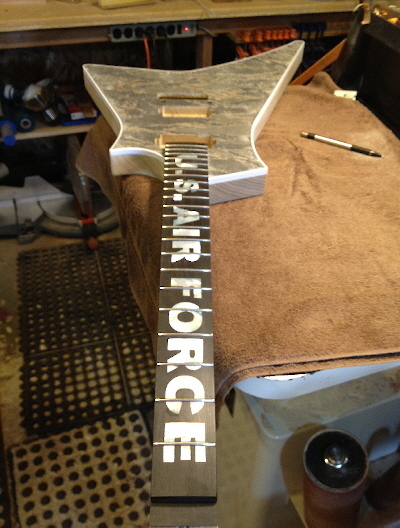 The guitar was commissioned to be made as a tribute to 9 Fallen Airmen of the United States Air Force. Guilford Guitars will very likely never make another guitar for anyone, famous or not that bears more significance that this one. As the story unfolds before you below, please understand that our part in it is just one part of a greater story told by the commitment and sacrifice of many Americans and deserves your full attention. Please take the time to view the link to the Fallen Airmen and understand who they were - afterall, they are what this guitar is all about. Please consider a donation to their memorial fund - it is something you can do to show your appreciation for their sacrifice. If you've ever wanted to see the what it takes to build a very special, high priority, custom made guitar this is the page for you. It is important to acknowledge the contributions to the tribute guitar by the following companies. We asked them if they would assist AND NOT A SINGLE ONE OF THEM HESITATED TO DO WHAT THEY COULD TO HELP. We are proud to be associated with them. 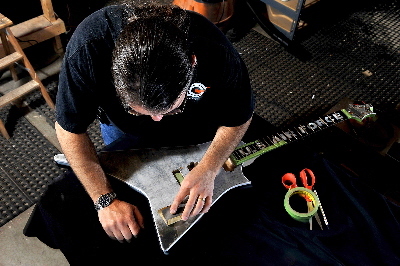 The guitars in the shop typically begin with body production. 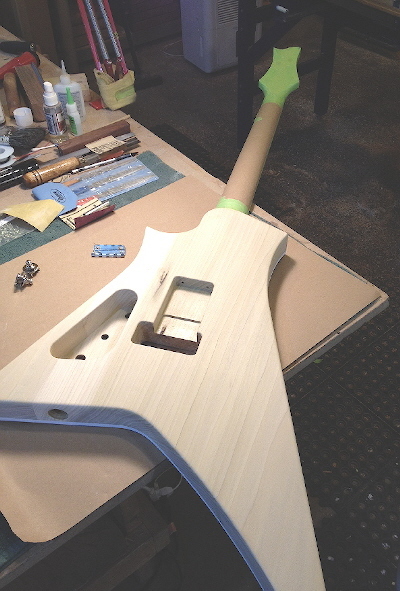 This tribute guitar gets a Poplar body - a fine domestic hardwood for electric guitars and standard issue for Redeemers. The body is profile cut with a bandsaw and level sanded. The sanding bar is actually intended for model airplane hobbyists but I've found it is ideal for sanding a shape like the Redeemer. 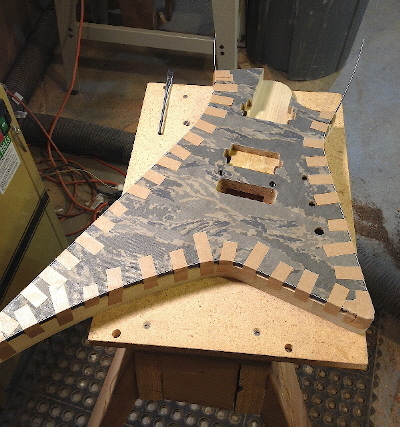 The body is now well sanded and the binding channels are cut specifically for the multiply white and black binding. Arguably the most dramatic feature of the guitar is an actual camouflage jacket worn by Major Henry Cecil during his tour in Afghanistan. For the Major, it is significant as he wore the jacket among his friends who would later be among the fallen. 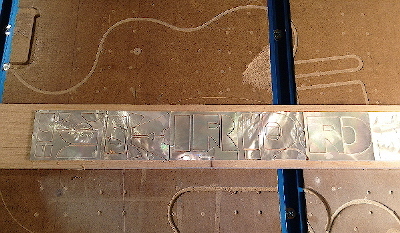 It is laminated to the top of the guitar body and allowed to dry thoroughly and carefully trimmed back as needed. Before being trimmed back, the body gets several coats of vinyl sealer to help stabilize the material and is already looking amazing. The jacket has now been trimmed to perfection while the glue residue has been carefully cleared from the binging channels. The First layer of binding has been prepped and is now ready to be glued in place. The binding is secured with tape and allowed to dry. This happens in phases so the ends of each corner can come together and matched for best appearance. The keen eye will notice the untrimmed binding on the upper bout sides. A nice closeup shot to see the second and final layer of white binding as it is taped and drying. It would have been much easier to simply put a burst around the edge but this is absolutely not a guitar to take shortcuts with. 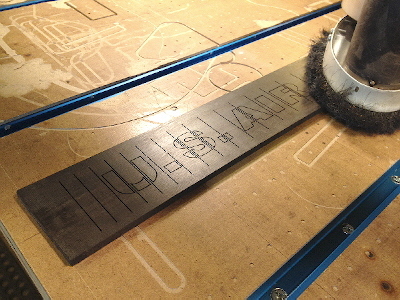 With the body now well established and almost ready for the neck, work has begun on the fingerboard inlay. Major Henry Cecil and myself shared several ideas before we agreed on a bold US Air Force font to cover the entire neck. I wanted this guitar to make a bold statement on stage. 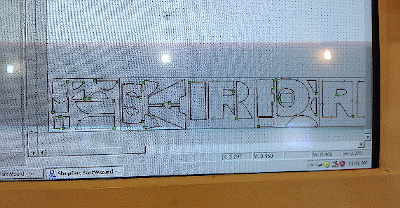 This image shows the software and individual pieces layed out in proportion to the actual shape of Mother of Pearl slabs. A beautiful mess. 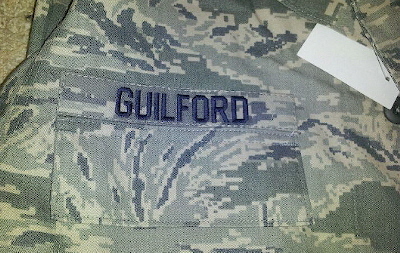 The Air Force font letters are all there but not exactly readable yet. The slabs are glued to some scrap wood to keep them secured while a tiny router bit cuts them out. Then, the pieces are soaked in water to seperate the Mother of Pearl from the wood without any damage. The most dramatic choice for a Mother of Pearl inlay is ebony. The Letters have been carefully arranged to maximize readability. This picture shows the same small router bit (as small as a dental bit) cutting out the fret slots independently from the inlay pockets. This leaves a small amount of wood to block any glue from seeping into the fret slots and having to be cleaned out later in the build. 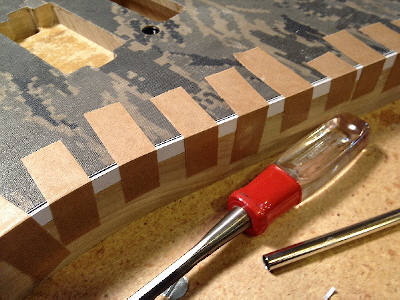 Thin pieces of tape cover the fret slots while the inlay pieces are glued in place. From this angle, I can share a secret that I haven't shared until this writing. The "U" was centered between two frets for readability as was the "S" - which now happens to look like a dollar sign! The "A" is also centered up and reminds me of a runway for some reason. With the inlay level sanded I've got a fingerboard suitable for the rest of the guitar. 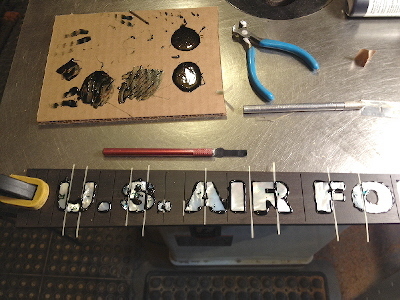 Given the Air Force font, amount of letters and available space of a fingerboard all came together extraordinarily well. 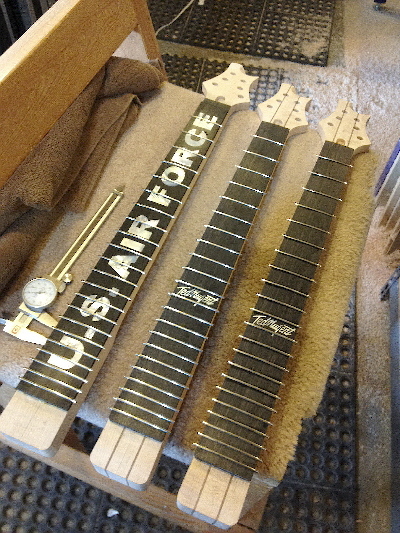 A Guilford guitar neck is assembled counter to production methods employed by several major US brands. Why? 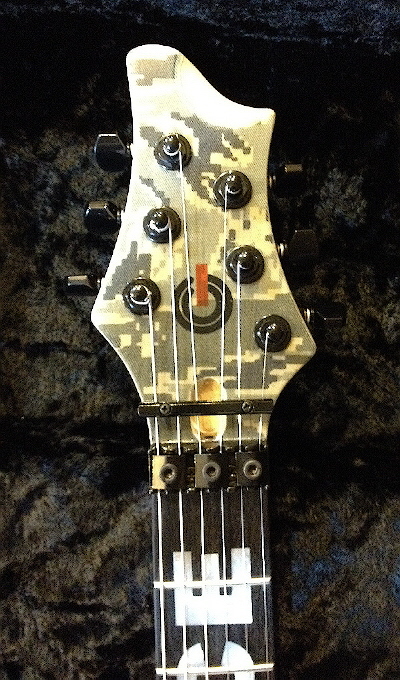 Because it is simple and works exceptionally well if you can afford to monitor the neck at all stages for accuracy. 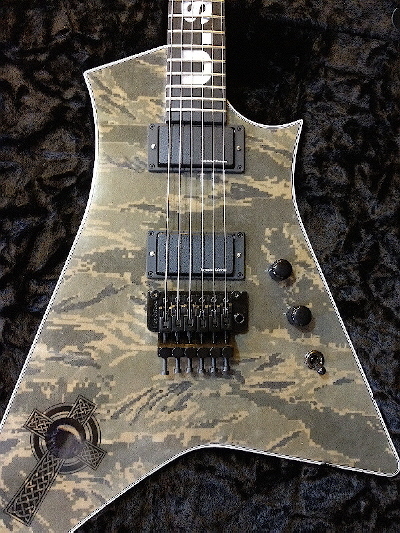 The guitars are all made by myself so this kind of special attention is not a problem. 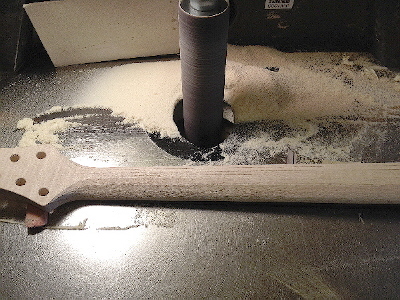 This image shows the neck after the clamps have been removed and sits for about 24 hours before the next step. Leonardo Davinci was once quoted as saying that he achieved is marverlous sculptures by simply removing all the rough material that didn't belong. We build each neck that way! 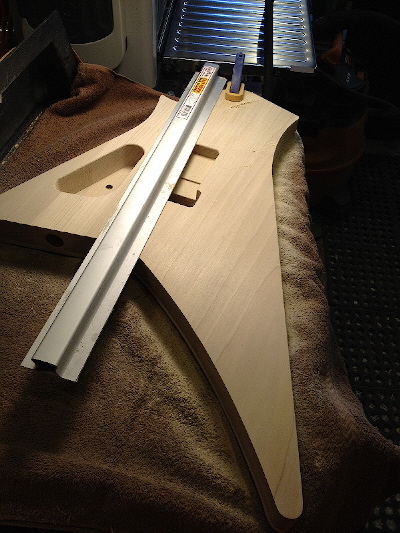 This picture shows the headstock as it takes shape one cut at a time. A totally unique feature exists on each of my headstocks - a detail that differentiates the Guilford brand from every other. We leave a distinctive point at the tip of the headstock that can only be done correctly if you start with a thick piece of wood to begin with. This is typically cost prohibitive for larger production. It is carefully sculpted with a variety of hand tools. The frets on a Guilford guitar are pocketed. That means the tangs don't protrude on the side of the neck - they can't be seen or felt in all seasons. This takes more labor to achieve correctly. Time and care is spent to cut each tang so that is fits precisely into place without pressure or voids. This is precision you can't see and may not be aware of but nevertheless - it's what we do. After the frets are meticulously preparred, they get pressed into place for precision and glued permanently bonding them to the neck and increasing the tone and resonance. 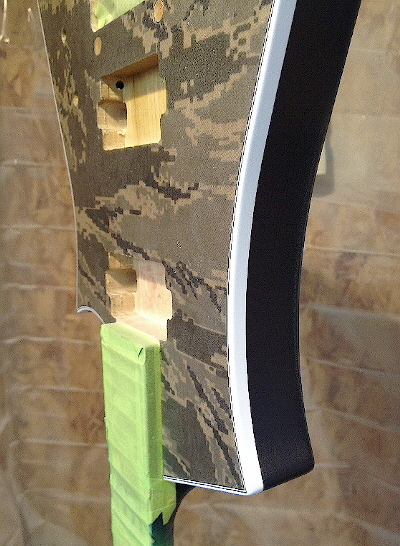 It is now when you can appreciate the extra material left in place between the fret slots and the inlay pieces. 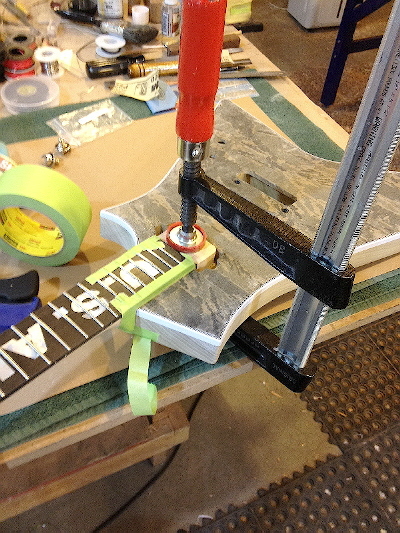 The fret barbs get something to bit into but the compression doesn't crack the large pieces of inlay. You probably wouldn't know it was a genuine benefit to you if I didn't tell you - again, no compromises on this guitar or any other we do. This is the only photo in existence that shows the shape of the neck in progress. It is a proprietary process and requires a trained eye and much skill during this stage of the build. 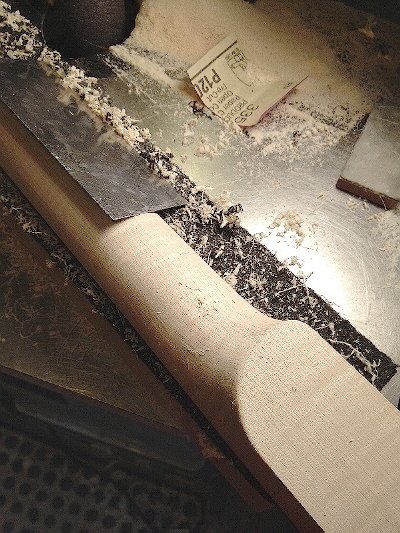 No room for errors - each neck is hand worked from rough removal to the finest detail sanding. A scraper is used to flesh out the finer detail so that the neck feels completely smooth. There is much debate and misconception about flame and birdseye maple when used for a guitar neck. We use only domestic quartersawn maple well seasoned and selected at a premium for the finest possible stock. It just so happens that the tribute guitar was being built along side two guitars I was making for Ted Nugent. Go figure. The neck is being glued into the body. You are dealing with components until this critical stage of the build. After this happens, you are now working with a guitar - an instrument - something that may out live you. The neck angle is extremely critical so much care is taken to achieve it with much precision. You can shim a bolt-on neck to correct a poor neck angle but it has to be done right the first time when you are gluing in the neck - especially with a Floy Rose bridge! The neck tenon is cleaned up in the neck pickup cavity with a dremel - another thing a large factory wouldn't bother to do. The guitar is inspected very carefully for any possible little ding. This picture is the one that made the local news paper and made a local celebrity of me on a certain Sunday morning. 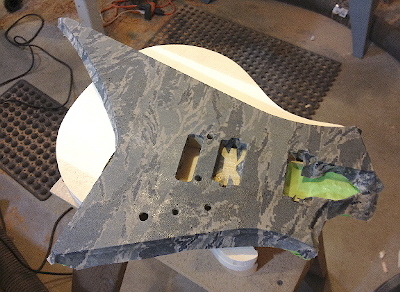 No guitar makes it into the finish booth until it has been carefully taped off as needed. Don't underestimate how much time this step takes! 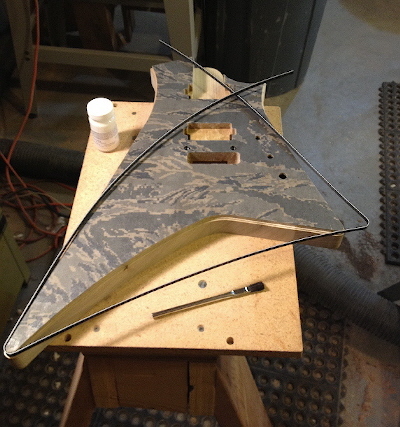 The Floyd Rose arrived just in time to allow final hardware preparations before finish gets applied. A good shot of the headstock prior to the finish. 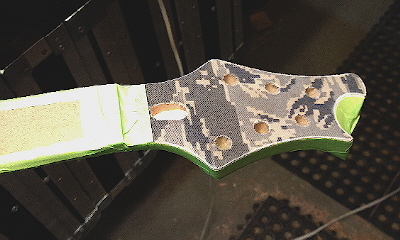 The headstock wasn't going to get the camouflage cover but it was the correct decision to include it because the frontal appearance wouldn't have been complete without it. Major Henry Cecil wanted the back of the tribute guitar to have the same shade of Navy Blue that is shown on the uniform stitching. I mix my colors in mason jars and there is an art to getting the shades just right because they can look a certain way in the jar, change when they dry and look quite different when the hit the guitar all depending on how many coats you apply. At this point, I've got the color. That's a match folks - it even captures the way the light sinks into the stitches. This is the picture I sent to Major Henry Cecil and he was well pleased and started to get excited about the way it was coming together so well at this point. The guitar was coming together so well under a tremendous amount of pressure - something had to happen, right? Always does. 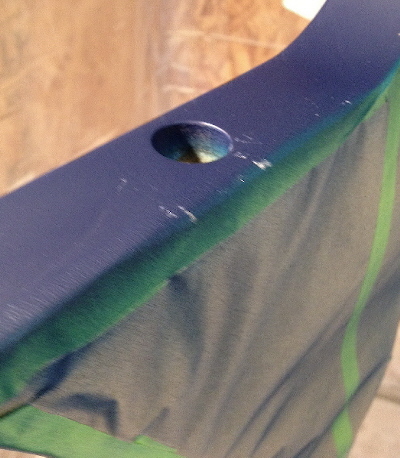 In this case, for the first time ever, a bird found a way into the shop through the spray booth fan of all things. It walked on the floor just enough to get some lacquer dust on it's feet and then decided to fly around the booth and of course, land on the wet paint. You can see the dust he left behind. I almost had a heart attack but soon realized it was just dust that wiped off and the few scratches were so minor that the clear coats would melt them away. A bird - why did it have to be a bird? 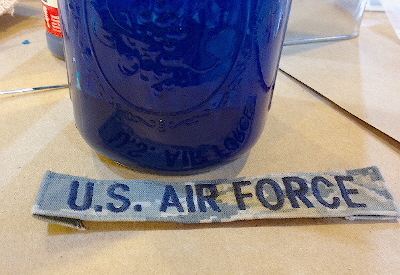 Was it because it was for Air Force? I don't know. The lacquer coats are about half way built up at this point and it is great to see what the finish is going to look like when is complete. It's unavoidable. There is going to be a lot of sanding if you want a mirror smooth finish. The fabric of the jacket was really quite thick and it is taking several more coats than usual on the top of the guitar to get the build required. 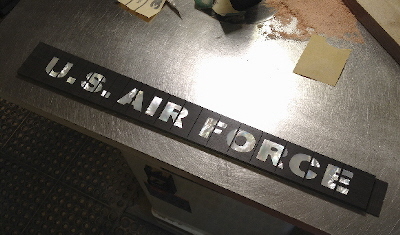 At this point, I had the pleasure of hosting two Air Force media personnel in the shop to document the build process and develop a bio story on me with some background. They stayed for two days and took a lot of pictures and shot a lot of video. For those two days, I felt like a reality TV star - literally. this from an Air Force Major. Fits great! This picture shows the layout in its early stages. Major Cecil and I collaborated throughout the process but most of it was regarding the memorial backplate. We had a lot of ideas at first and things evolved quickly when I finally got the time to focus on the names. How should they be listed? Who should be listed first? In what order should they be listed? It was during this point of the build that I actually took the time to visit the memorial website and read the bio of each Airman. That's when the importance of this started to sink in. I understood what I was doing - I got it. But it wasn't until I saw the faces and read the stories of these fine people that I had an emotional connection with them and what I was doing. They really were Americas finest - they were all bright, highly educated, competent, highly motivated individuals with full lives ahead of them. They will be remembered. This picture shows the complete memorial plate. I used a 5 ply pickguard (B/W/B/W/B) because a 3 ply wouldn't have shown the names corrrectly unless you were looking at it dead on. The route would have been too deep you see. The plate took several hours of development and a couple of sheets and several more hours of machine time to get it right. There were 9 dead. Their names had to be listed on the back of the guitar yet there was only so much space with which to work. 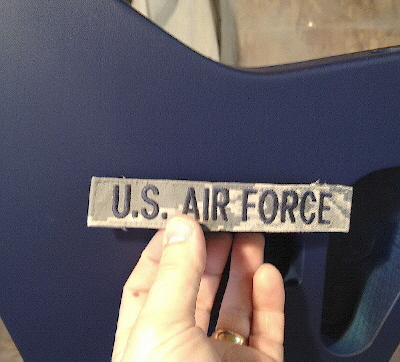 The backplate had to serve two purposes - functionally, it had to cover the electronic and tremolo cavities and it had to honor the names of the Airmen. In the end, It came out beautifully and just like the Inlay on the fingerboard, things just seemed to fall right into place. Major Henry Cecil was relieved to see the Silver Star and Purple Heart fit so well on the plate - that is was oriented correctly - first the Silver Star and then the Purple Heart, in order of significance, side by side, just as it would appear on a uniform. Wired, Set up, complete! It has been tested briefly and it rocks. The Floyd Rose Bridge and Seymour Duncan Blackout pickups all in black give the guitar the finishing touch. The Guilford trademark fit well on the headstock. Take a look at that!. It feels fantastic to have accomplished the build. When the stakes are high, with so much to do in so little time (60 days give or take), it could not have been done any better. 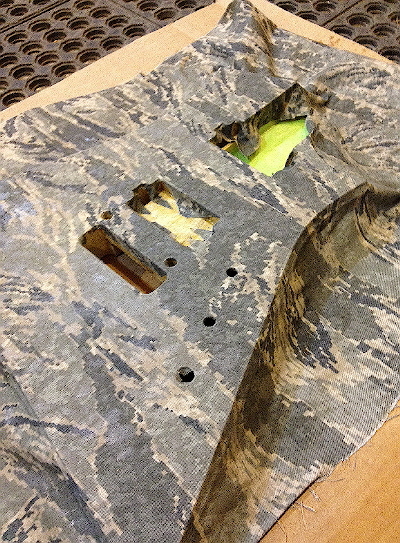 In three days it will be unveiled at the Dallas International Guitar Festival with Major Henry Cecil in the booth. I load up the vehicle with 16 other guitars and look forward to the road trip. My arms are tired from the build and it will be good to see America go by at 75 miles an hour. 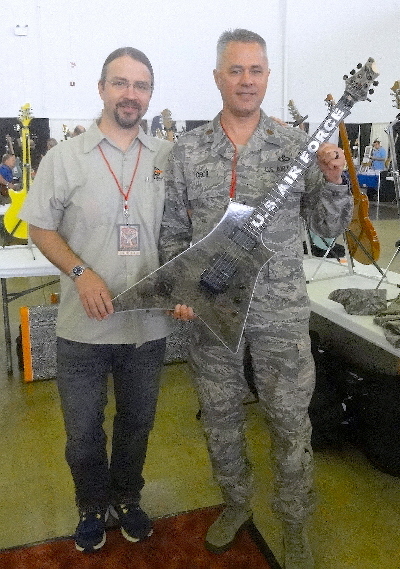 Major Henry Cecil and Myself at the Dallas International Guitar Festival. After working with him online and over the phone, it was awesome to spend some time with him. He is a friend of mine now and there isn't anything I wouldn't do for him. The guitar wasn't on display long. On Saturday that weekend, it was already gone from Dallas and on display at another very well attended event: an Air show, of course. 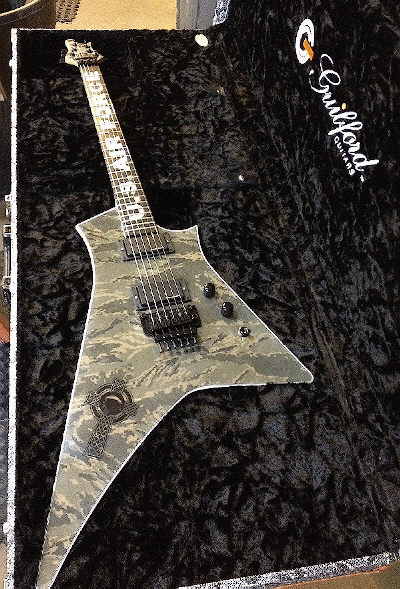 Shortly after that, it was in the hands of Steve Blaze of Lillian Axe on stage. It's out of my hands now but the story continues, in fact, it is just getting started. Please, consider giving what you can - give a donation and help the families of those fallen Airmen - the NATC-A Nine.